I've come across my first job interview at lowly Annagh United in the 3rd tier of Northern Irish football. This question towards the end of the interview flummoxed me somewhat. The league splits in two after 22 games, followed by a further 5 games. Total games played will be 27. Not even Pep Guardiola would expect to achieve a top 2 finish from this position! Alas, whatever option I choose I may well be judged as not achieving it and given the sack. There should be a more realistic response to give. I think the Chairman's view here is one he would have had at the start of the season, and there has been no amendment of this opinion half way through the season. Do you have a save game just before this job interview generates? If you are unsure how to provide this, please follow the guidelines below. I've loaded 2 files up, one before and one after. Thank you for providing this save. We have checked this out and are currently unable to reproduce at our end on the latest code. If you do encounter this at a later date could you please inform us so that we can check this out? That's strange and a shame you couldn't reproduce it. Really the answer options of keeping the club up, or steering well clear of relegation should have been there. Hi, I've fired up FM now I'm home from work just to see if I can replicate the answers I gave to the job interview from the first time. I remembered my responses and I've replicated the above problem. If you load the file titled " beta Unemployed pre annagh interview.fm ", and start the interview. I have numbered the response answer to give in each question (1 being the first option, 2 the next and so on). First the welcome question has only one option for a response so that is 1, then it goes 4,2,1,1,1,8,8. 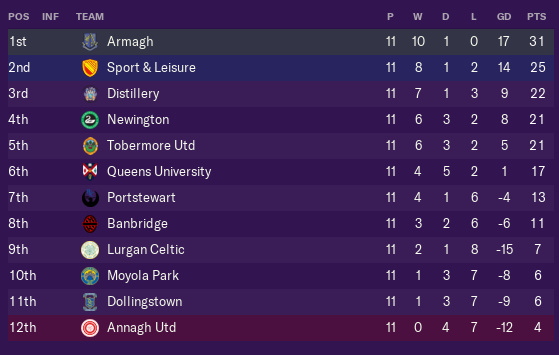 It's at this point where I get asked if I can achieve the playoffs or better as per the screen shots at the start of this topic. If I come across it again I will let you know. Just out of curiosity I holidayed to the end of the season to see what happened. Annagh stayed up by a point, and offered me a new contract, and not the sack as I thought would happen!